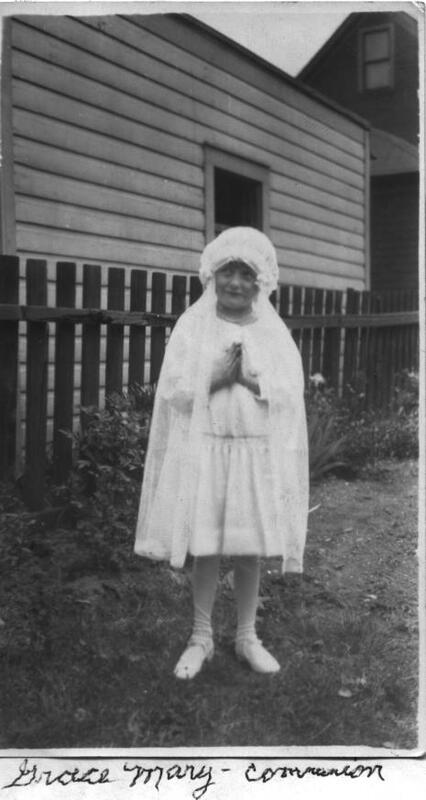 Grace Elizabeth Mary, first communion. 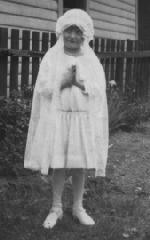 Grace Elizabeth Mary was the daughter of Edward and Martha Mary and the sister of John Bernard Mary and Olive (née Mary) Mammoser. 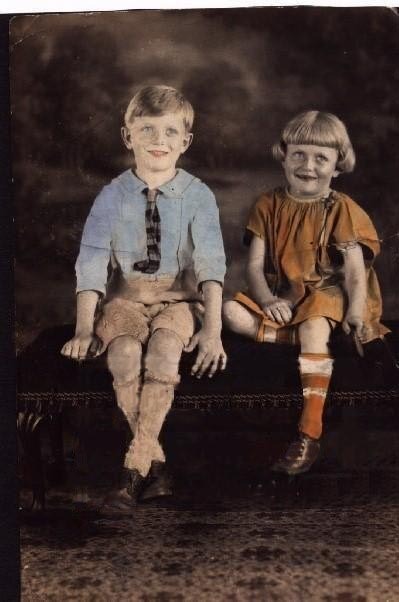 Grace was born at home (163 Leslie Street, Buffalo, NY) on March 30, 1923. She was a 7-month baby and weighed 1½ lbs. at birth. She was so small that she fit inside of a cigar box. They had to carry her around on a pillow. 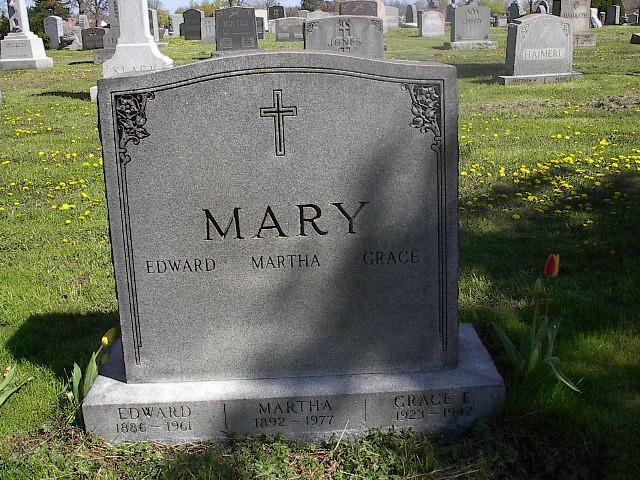 It is a wonder that she survived, but her father, Edward, stayed at home from work to care for Grace and for her mother, Martha. Grace grew up to be a very beautiful young lady, with long natural curly strawberry blonde hair and big blue eyes. 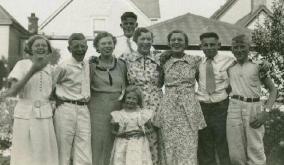 She was a great help to her mother around the house and was quiet mannered, very bright, and cheerful. Grace's hobbies were knitting and crocheting. 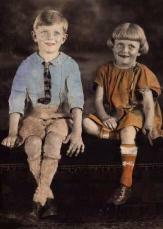 She loved rollerskating and would go with her brother, John sometimes two or three times per week. There, Grace met a young man by the name of Frank DeMarco. He loved her so much and proposed marriage to her, but Grace declined as she said, "Someday I want to become a nun." 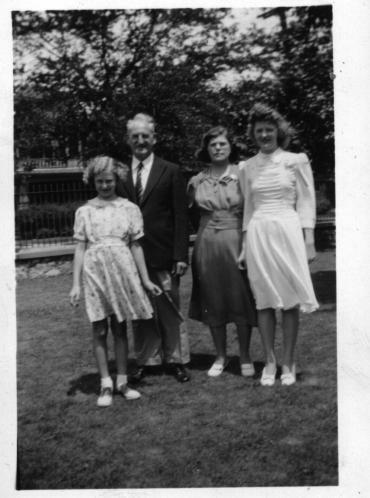 Grace attended St. Matthew's Parochial School and graduated in 1941 from St. Mary's Business School in Buffalo. 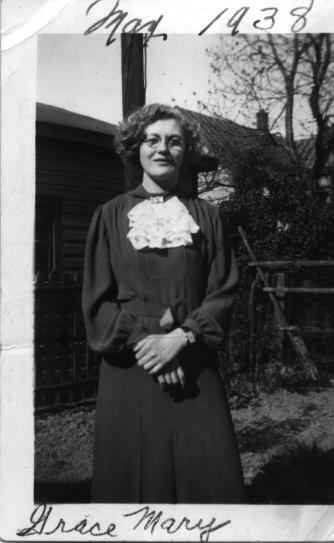 She applied for secretarial positions all over the city, but she was so young (age 17) that no one would hire her. Grace worked for a short time for the Democratic County Committee. 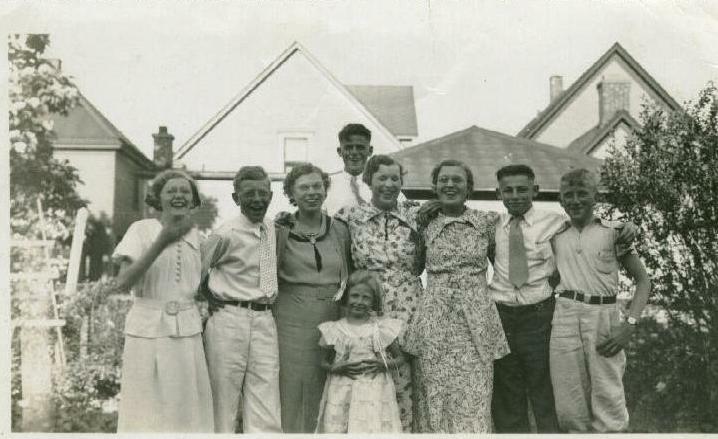 Then, at the age of 18, she took a job as a waitress at a restaurant at 1832 Main Street in Buffalo --- near Sisters Hospital, where her brother worked (they would ride to work together). 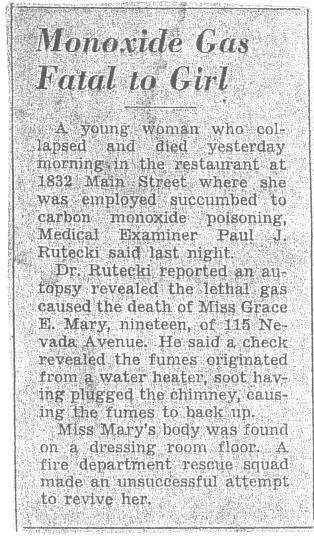 On February 16, 1942, while changing into her uniform, Grace died at work of carbon monoxide fumes as a result of a defective hot water heater. Funeral services were held in the family home at 115 Nevada Avenue and at Saint Matthew's Church. On the day of her funeral, a letter from Westinghouse Electric Corporation arrived stating that they would hire Grace as a secretary. Text written by Olive Mammoser, sister of Grace Elizabeth Mary. 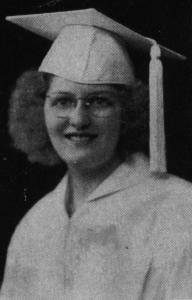 Grace Elizabeth Mary, graduation photo from St. Mary's Business School, 1941. 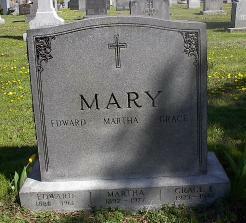 Grave of Grace Elizabeth Mary, her parents Edward and Martha (née Schwert) Mary, her brother John Mary, and her uncle Rev. John B. Schwertfeger/Schwert. Mt. Calvary Cemetery, Lot 250, Section D, Cheektowaga, NY. Obituary: Grace Elizabeth Mary, February 16, 1942. Newspaper Article: Describing cause of death of Grace Elizabeth Mary. 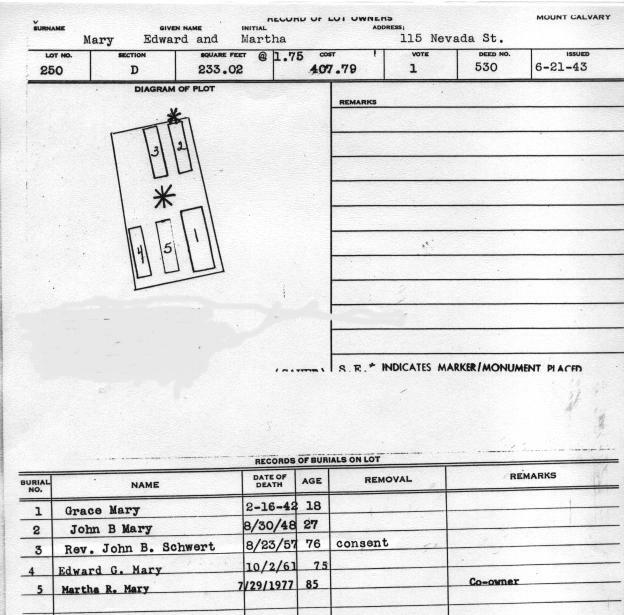 Cemetery Lot: Official record from Mount Calvary Cemetery (Pine Hill), Cheektowaga, NY, for Grace Elizabeth Mary.